In our last blog post, we talked about the best ways to get online ratings and reviews and the reasons why you need them. Yelp reviews, Facebook reviews, and other online review sites are the new word-of-mouth referrals. They offer insight into your business and allow potential customers to make a decision, to hopefully, do business with you. But, as more businesses become aware of how important ratings and reviews are, that means getting people to look at your online business page or social media profile will become even more challenging. People are bombarded with so much information these days: How can you stand out from the crowd? If you’re an insurance agency looking to grow your book of business, this means that you have to take your online marketing game to the next level. And one way to do that is through adding photos to your online directories, business profiles and social media pages. These photos live alongside your Facebook Business page, Google My Business page, Yelp Business page, Bing Places for Business page, and other social media and business profiles and are one of the most effective ways to drive people to your insurance agency, via your office telephones and your microsite’s form-fills. How photos are a powerful new form of “word-of-mouth” referral today. Best practices when uploading photos to your accounts. How Are Photos The New Form of Referrals? These days it’s so easy to share photos with other people, thanks to the Internet, social media and mobile devices. With a click of a button or a tap on the screen, that picture of your delicious lunch or adorable children can be shared with friends and loved ones instantly. This statistic is taken directly from Google. So what is it about photos that drive people to click or get directions to a particular business? The answer is simple: people today want to know more about you and the people behind your business before they ever decide to call, visit or tour your microsite. They want to know that your insurance agency is more than just a logo or a name. They want to see the whole story, the faces behind the brand, and what it is you offer aside from your products and services. And photos are the best way to do that. It’s human nature, after all. My personal opinion is that people don’t want to really read, online, anymore. This is a major shift in consumer behavior that you should get ahead of, digitally, moving forward. 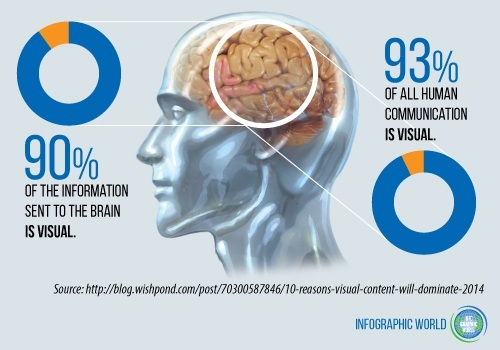 Thirty percent (30%) information our brains process is visual (compared to the 3% hearing and 8% for touch). So, it’s no wonder that pages with images or video garner about 94% more views than text-only pages. Think about the last time you went out to a restaurant. Did you look at their photos? Didn’t you want to know about the ambience before you made the decision to visit that particular restaurant? In addition, didn’t you want to see some actual food dishes to further validate your decision before making the trip? Of course, you did. You’re not alone. A few weeks ago, I was searching for a nearby cafe where I could sit, relax and do some reading. I quickly pulled up my Yelp app, because I knew that the restaurant would probably have a number of photos to help me make the right choice. If that particular restaurant didn’t have those photos (nice ambiance, relatively quiet spot, wide enough tables for my laptop, etc), they definitely wouldn’t have gotten my business. I would’ve kept looking on Yelp. I frequently look for photos on a business owner’s Google My Business and Facebook pages, also. In short, photos allow your potential customers to get a feel for your business, even before they walk in the the door. Consumers are now demanding photos before making many of their buying decisions. Jeff Bezos, Amazon Founder, has made a tremendous living understanding this concept. So, when potential leads go to your online directory listings or social media business profiles, they will immediately get drawn in by the photos on your page. But that doesn’t mean they will want to do business with you right away. Your photos need to draw them in and keep them interested. They must be able to showcase your business, not only as professionally as possible, but also show your human side. So, what type of photos work best? First, a profile photo that shows your face or logo/branding and engaging and visually attractive cover photos (if applicable). Facebook, Yelp, Google My Business, Twitter, Bing Places and other sites have different requirements, so make sure you check terms of service on each one before publishing your photo library on those platforms. So, now that you have your profile and cover photo up, what next? Office exteriors, such as your building, driveway, and even your doorway – this allows people who may be driving to your location to instantly spot your office. Also, this gives people a good idea of the type of neighborhood in which you’re located. Google is big on displaying “street view” on many of their GMB knowledge cards, in the profile pic position. Employees – ask your staff to pose for headshots (these can be done in-house with a good camera phone) so your potential customers can see the people they will be interacting with. Events – this shows people you are active in your community and participate in different events. They might even approach you next time they see you. Customers – ask your customers for permission to share their photos or take photos with them next time you see them. Sharing photos of your happy customers is another form of social proof that your products and services are top notch. If you show pics of customers, many brands (State Farm, Farmers, Allstate, etc.) will require them to sign a photo release. What are the best practices when uploading photos? So, you may be asking yourself, what are the best practices when it comes to uploading photos? When should I upload the photos and are there photos I shouldn’t upload? Ensure the photos are of good quality. They should be clear and not blurry, and if you are adding text, proofread for any typos or grammatical errors. Use only appropriate images. If you’re not sure what’s appropriate, then think of it this way: if you can’t show it in a G-Rated movie, then don’t post it. Have the proper permission to post them. Obviously, you can post most G-Rated pics that you personally took from your device, but check the photos for prominent logos or business names. Also, if you have other people in your pictures, make sure you have their permission to post. For example, if you’re at a public event, most people will assume their photos might be posted online, though it’s good to tell them, “Hey, I’m going to put this on my Facebook page, do you mind?” But, if you’re taking a photo of a customer in their private space, like their home or office, it’s best to get explicit permission, and have them sign the photo release (most brands’ marketing departments provide photo releases). Some brands’ marketing departments will say, “Just ensure you have a photo release on file.” Check with your corporate marketing department to assure 100% compliance. Post during the day. Studies show that weekdays are the best time to post on most networks, but your mileage may vary. Try different times of the day to find out when you get the most engagement. Tag people in your photos. This can help increase your photos’ reach and have friends of friends see them. Are photos really integral to growing my book of business? Many people prefer not to share photos of themselves or their family, especially young children. That’s a matter of personal choice of course, especially for those concerned about their privacy. However, in today’s hyper-connected world, photos are a must for anyone building a brand or insurance agency online. Photos allow your customers to see and assess your business. Again as was already mentioned, many consumers today make their buying decision before they ever decide to contact you, through an office visit, telephone call or filling out your microsite quote form(s). So, hopefully, you can make a great first impression with the photos that you share. Build a solid “photo library” throughout all of your digital assets. Your digital eco-system will come alive in your market, by prominently displaying your photo library throughout your community, online. But, aside from merely attracting human eyeballs to your page, there’s another more practical reason why you should add photos to your social media and business profile pages: search engine optimization, particularly voice search. We’ve already talked about why voice search matters. The fact is, the more people that view your page, photos, and leave reviews, then the better ranking your web pages will have in the SERPs (Search Engine Results Pages). This, in turn, will help to drive up your agency’s voice search results in the fast-growing voice search assistants, such as Google Assistant, Google Home, Amazon Alexa, Apple Siri, Microsoft Cortana and many more coming to market as I write. There are many resources out there to guide you in finding the right type of photos and content to share on your social media and business listings pages. I’ve even listed some of them on this post. But, you might be too busy with running your insurance agency, recruiting, training and retaining talent and making sure your customers are taken care of. So, why not let us do the driving? Agent Branding System can help you come up with a social media strategy that can maximize your engagement rates, increase traffic to your page, and bring you the most qualified leads. Your online reputation should be your biggest asset. You can fully leverage it with building out your digital, photo library. We have the experience and know-how to guide you every step of the way. Call us now for a 15-minute informational session on how photos and ratings and reviews can help you grow your book of business.